While a publicity stunt, especially a copycat performance, won't work for most bands, the original concept worked for Atomic Tom. One clever idea on a subway turned their album into an overnight success. Their first major audience included a handful of people on a New York subway and, believe it or not, iPhones. That alone wouldn't be enough to cover it here. This Brooklyn-based band has what it takes. After releasing their debut, The Moment, the band was struggling to find inventive ways to get the word out beyond their loyal following in New York. They needed to think big, and in doing so they ended up thinking small. It started with the brother of guitarist Eric Espiritu. He suggested they film a video of sorts on a train going across the Manhattan Bridge. The only catch was that they were to do it with no instruments. Instead, they would use iPhone instruments. The stunt serves as an introduction to a great band. 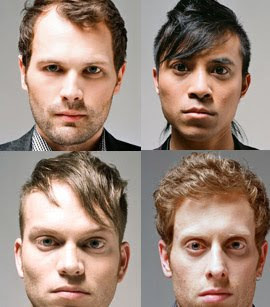 The resulting video for Take Me Out features band members doing just that. They play with iPhones connected to small amps: guitar (Espiritu) bass (Philip Galtizine), drums (Tobias Smith) and microphone (Luke White). Adding even more allure to the magic is that the entire video was shot live, again, with nothing more than three iPhones. Once added to YouTube with a single notation — “In October of 2010, New York’s Atomic Tom had their instruments stolen… fortunately…they know how to improvise.” — the video went viral. To date, they have attracted more than 3.5 million views. The stunt left some people wondering whether it was put together by Apple. But there were plenty of critics who were ready to report on their made-up stolen instrument story. As the write-ups and views continued, new fans bought the song and television hosts Jimmy Kimmel and Rachael Ray asked the band to appear on their shows. They haven't settled on a sound, but that doesn't detract much. Had this amounted to nothing more than hype, the story would have been scrapped. However, on review, Atomic Tom has talent. The Moment is a great body of work, complete with a mix of dance rock, new wave, and 80s rock. Expect to hear some influences, such as the Killers and perhaps a hint of the Cure. Some standouts include Take Me Out, which sounds like an arena rock staple. We Were Never Meant To Be is a romantic ballad. And all of it was recorded in a friend’s apartment. The Moment is an outstanding debut, even if the track listing remains a bit all over the place — up, down, all around. Atomic Tom’s The Moment Rocks In With A 5.7 On The Liquid Hip Richter Scale. Viral video aside, Atomic Tom has managed to capture a fresh rock/pop/alt rock sound and bring a genuine enthusiasm to the proceedings. They’ll be playing some dates in Massachusetts, Virginia, and New York. They also have a growing fan base on Facebook. You can pick up The Moment by Atomic Tom is on iTunes. On Amazon, you can find their first EP as well as The Moment. They signed with Universal Republic Records.